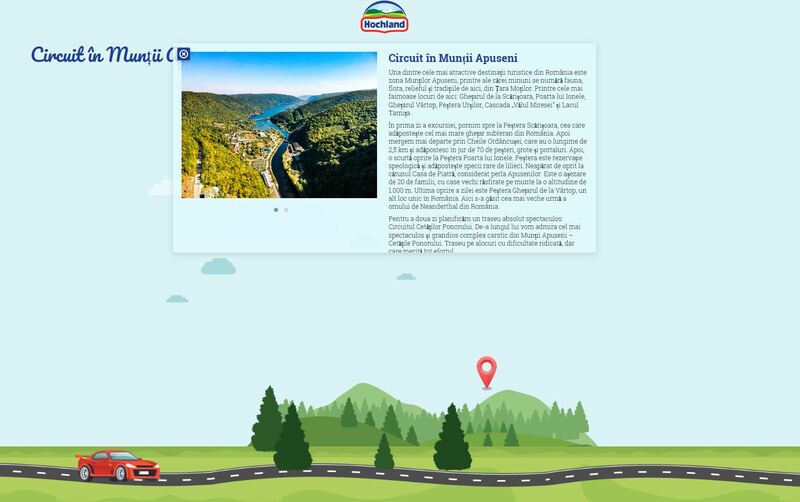 Brief: Hochland asked for our help in promoting their campaign and contest „Călătorește în România cu Hochland”. They asked for a special project that would boost their own campaign, bringing it to larger audiences. Concept: Create a customized travel guide that our readers can use as inspiration and motivation to start their own adventure. The experience was created so that it fit everyone. The travel guides offered information about day trips but also longer trips with info about each destination, hoe to get there, what to do etc. Delivrables: special website with interactive design (includes concept and copy, design, coding, management), 10 articles (heavily researched, carefully crafted), contest (mechanism, management), native advertising, promotion.